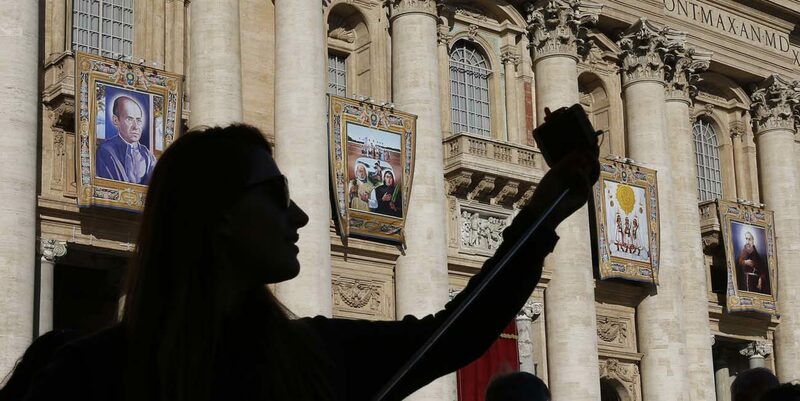 VATICAN CITY (CNS) — The church’s newest saints represent a diverse group of people who offer encouragement and hope to Christians today through their example, a Brazilian bishop said. Saints like the “Martyrs of Natal,” Brazil, offer a “new opportunity, hope and a renewal of faith” that can bring peace to a world battered by injustice, war and violence, Archbishop Jaime Vieira Rocha of Natal told journalists Oct. 13 during a press briefing. “The grace of their canonization will certainly help create a society that is less vengeful, less violent, more fraternal,” and encourage Catholics to stand up “for the dignity of the people,” he said. Ornate tapestries depicting each of the soon-to-be canonized saints — who hail from Brazil, Italy, Mexico and Spain — draped the facade of St. Peter’s Basilica as workers busily prepared the square for the Oct. 15 Mass to be presided over by Pope Francis. The “Martyrs of Natal” — Blessed Andre de Soveral, a Jesuit priest; Blessed Ambrosio Francisco Ferro, a diocesan priest; Blessed Mateus Moreira, a layman; and 27 others — were killed in 1645 in a wave of anti-Catholic persecution carried out by Dutch Calvinists in Natal, Brazil. Father Julio Cesar Souza Cavalcante, an expert on their cause, told journalists that the 30 Brazilian martyrs — which included priests, laymen and laywomen, families, husbands, wives, children and youth — are models for all Catholics, especially in Brazil today, who want to follow the pope’s call for a “church on the move” that goes out and gives public witness to their faith. “Martyrdom is always this witness. And to give this witness of faith in a country that today is in an economic, security and health crisis, it is a witness that it is possible to go forward, it is possible to do more,” Father Souza said. The “Child Martyrs of Tlaxcala,” Mexico — Blesseds Cristobal, Antonio and Juan — will also be declared saints by Pope Francis at the Mass. The children, whose ages range from 12 to 13, were among the first native converts in Mexico and were killed between 1527 and 1529 for refusing to renounce the faith and return to their people’s ancient traditions. With a Synod of Bishops focusing on young people taking place in 2018, the child martyrs “are a motivation so that young men and women may be agents of the evangelization in their own families” and confront the idols of the modern world. “Young people are immersed in a series of idolatries, which they sometimes passively accept,” Msgr. Gomez said. “The martyrs, at their age, had the capacity to confront idolatries that were common in so many places” at the time. The pope will also canonize Blessed Angelo of Acri, an Italian Capuchin priest who was born Luca Antonio Falcone. He died in 1739 and was beatified by Pope Leo XII in 1825. A famed preacher, Blessed Angelo proclaimed the good news of the Gospel “in a simple, concrete way and not just by saying words,” Capuchin Brother Carlo Calloni, postulator of Blessed Angelo’s cause, told CNS. He was also known for his defense of the poor and “knew how to raise his voice against the powerful of that time,” Brother Calloni said. However, he added, Blessed Angelo combined his sharp wit and intelligence with mercy when it came to the confessional, often spending long hours listening to repentant men and women seeking forgiveness. Brother Calloni said the Capuchin priest’s zeal for saving souls can serve as an example for the church’s mission in reaching out to those who have become distant from their faith. “Blessed Angelo can be the model for those who seek a new way to bring the proclamation (of the Gospel) to the world and that it may be heard by the people,” he said. Pope Francis will also canonize Blessed Faustino Miguez, a Spanish priest and a member of the Piarist Fathers born in 1831. He started an advanced school for girls at a time when such education was limited almost exclusively to boys.